Venerable journal Science has announced its top breakthroughs of 2009, and topping the list is a breakthrough in evolutionary biology. It's the discovery of Ardipithecus ramidus, a 4.4-million-year-old hominid skeleton that reveals how homo sapiens' ancient ancestors looked and lived. [The Ardipithecus research] changes the way we think about early human evolution, and it represents the culmination of 15 years of painstaking, highly collaborative research by 47 scientists of diverse expertise from nine nations, who carefully analyzed 150,000 specimens of fossilized animals and plants. 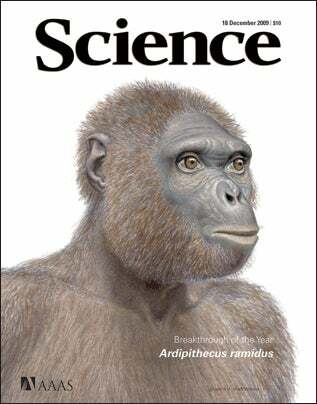 Nicknamed Ardi, the hominid lived in what is now Ethioipa, and is a million years older than Lucy, the ancient hominid sometimes called the "missing link" between apes and humans. In fact, there is likely no one "missing link," and instead scientists have discovered there are many stages between proto-humans and what we would recognize as homo sapiens today. 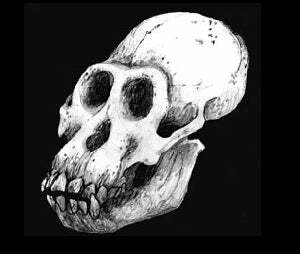 After analyzing the skull, teeth, pelvis, hands, feet, and other bones, they determined that Ardipithecus possessed a mix of "primitive" traits, shared with its predecessors-the apes of the Miocene epoch-and "derived" traits, which it shared exclusively with later hominids. However, many of its traits do not appear in modern-day African apes. One surprising conclusion, therefore, is that it is likely that the African apes have evolved extensively since we shared that last common ancestor, which thus makes living chimpanzees and gorillas poor models for the last common ancestor and for understanding our own evolution since that time. In other words, humans did not evolve from apes at all. Present-day apes and humans are radically different from their common ancestor. Pulsars Detected by Fermi: NASA's Fermi Gamma-Ray Space Telescope helped to identify previously unknown pulsars-highly magnetized and rapidly rotating neutron stars-and shed light onto their unique gamma-ray emissions. Rapamycin: Researchers found that tinkering with a key signaling pathway produces life-extending benefits in mice-the first such result ever achieved in mammals. The discovery was particularly remarkable because the treatment did not start until the mice were middle-aged. Graphene: In a string of rapid-fire advances, materials scientists probed the properties of graphene-highly conductive sheets of carbon atoms-and started fashioning the material into experimental electronic devices. Plant ABA Receptors: Solving the structure of a critical molecule that helps plants survive during droughts may help scientists design new ways to protect crops against prolonged dry periods, potentially improving crop yields worldwide and aiding biofuel production on marginal lands. LCLS at SLAC: SLAC National Accelerator Laboratory unveiled the world's first x-ray laser, a powerful research tool capable of taking snapshots of chemical reactions in progress, altering the electronic structures of materials, and myriad other experiments spanning a wide range of scientific fields. Gene Therapy Comeback: European and U.S. researchers made progress in treating a fatal brain disease, inherited blindness, and a severe immune disorder by developing new strategies involving gene therapy. Monopoles: In an experimental coup, physicists working with strange crystalline materials called spin ices created magnetic ripples that model the predicted behavior of "magnetic monopoles," or fundamental particles with only one magnetic pole. LCROSS Finds Water on the Moon: In October, sensors aboard a NASA spacecraft detected water vapor and ice in the debris from a spent rocket stage that researchers deliberately crashed near the south pole of the Moon. Hubble Repair: In May, a nearly flawless final repair mission by space-shuttle astronauts gave the Hubble Space Telescope sharper vision and a new lease on life, resulting in its most spectacular images yet.